What's the best mechanical keyboard for designers? Chuck out that awful old plastic thing and invest in a proper keyboard; we pick out four of the best. Sorry to have to break it to you like this, but the keyboard that came with your new computer is almost certainly cheap and nasty rubbish. Now, that might not matter to you if you mainly work with a mouse or stylus and only use the keyboard to fire off the odd tweet or email, but if your job involves a lot of typing, whether it's coding website templates or writing pitches, then you almost certainly need a better keyboard, and preferably a mechanical model. Why? Let's look at the big difference between a cheap keyboard and a more expensive mechanical offering. The cheap model's keys work using little rubber domes – the same as you might find on a pocket calculator or remote control; there's no life to them and they'll wear out relatively quickly. Mechanical keyboards instead use proper switches – usually from the Cherry MX range – that provide lovely tactile feedback when you press them and will keep on going for years and years. The best mechanical keyboards are streets ahead in terms of build quality, and in some cases they're also amazing to look at. They'll help you type faster and more accurately, and many can also enable you to spend longer at the keyboard without developing RSI thanks to ergonomic designs. And if you look around you'll even find models that you can program with macros, allowing you to nail repetitive task with a single key press. But, you ask, what's the best mechanical keyboard for a designer? Well, it depends on what you need. We've narrowed it down to four models, each one with a very different appeal; see which one works for you. The Advantage LF from Kinesis looks unusual because it's built with ergonomics in mind. Its concave key wells are designed to minimise strain on your arms and your fingers, reducing the danger of repetitive strain injuries, and its Cherry MX Red linear switches require minimal force, enabling fast, smooth typing for as long as you like. Additionally you can program up to 48 macros; perfect for word processing or for tiresome Photoshop operations. Yes, the price is eye-watering, but for pity's sake just look at it. Datamancer specialises in beautiful custom and decorative keyboards – many of them in a steampunk style – and the Streamline is far and away our favourite, built in an Art Deco style that emphasises curving forms and long horizontal lines in a polished aluminium frame with cascading deco sides. You can even choose from four typefaces to go with the mechanical keys. If your tastes are a little more ascetic, the CODE keyboard is a minimal mechanical keyboard for a very reasonable price. Designed to be timeless, modern and unobtrusive, with Helvetica on the keys and adjustable backlighting, this solid, steel-backed keyboard comes in a range of sizes, plus a choice of Cherry MX switches to suit your taste depending on whether you like things quiet or prefer loud clacky keys to let everyone know you're writing. Mind you don't spill your flat white all over it, yeah? Want to pimp your iPad Pro into a heavyweight writing machine? Look no further than this brand new offering from Razer, guaranteed to earn you plenty of covetous glances as you hammer out that annual report in a coffee shop. Razer's own ultra low-profile mechanical switches deliver the same performance and feel as a full-sized mechanical keyboard, and on top of that you get backlight illumination as well as Bluetooth connectivity and a metal kickstand. If you’re looking for a mechanical keyboard that enables you to take advantage of gaming-specific features, whilst also performing well as your day-to-day workhorse, look no further than the G810 from Logitech. 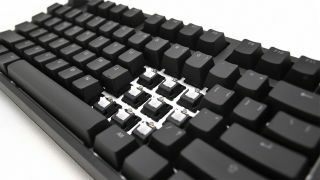 This keyboard uses Logitech’s Romer-G switch, which has been designed to be lighting fast, but also give a good degree of tactile feedback. Add to this the option to set defaults for individual apps, a volume scroll wheel, and some – frankly insane – LED configurations (scrolling rainbow, anyone?) and the G810 is hard to beat.